Sorry, no longer available. 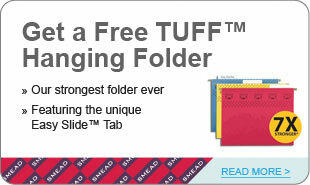 Get a free sample of Smead Tuff Hanging Folders as advertised in their March newsletter. Please note that the company information is optional to fill out – they shared this free sample on their Smead Organomics fan page so I really think they want to share it with everyone who is interested in their products. Thanks goes to Moms Fun Money for sharing this new sample.